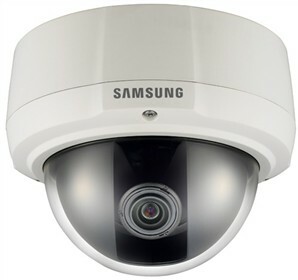 The Samsung SCV-3081 High-Resolution Vandal-Resistant WDR Dome Camera is encased in an aluminum die-cast chassis that provides unparalleled durability, making it suitable for both indoor and outdoor applications. In addition, the IP66-rated, weatherproof housing ensures uninterrupted surveillance in high-risk locations as well as in harsh weather conditions. Featuring Day/Night functionality, the camera switches between color and B&W as per changes in the ambient lighting, ensuring accurate color reproduction in daylight and enhanced B&W images at night. With the SV-V DSP chipset and 1/3" Super HAD CCD image sensor, the Dome Camera delivers clear images in various environments at resolutions of up to 600 TVL (color) and 700 TVL (B&W). Its 2.8 to 11mm varifocal lens lets you adjust the aperture to change the camera view, so that you can get either more detailed images or a wider coverage. With the WDR feature, this Vandal-resistant Camera can properly exposes scenes containing a mix of bright and dark regions, thus enabling you to identify details of objects in a high-contrast environment. The Samsung SCV-3081 has many exciting features for users of all types. See the Samsung SCV-3081 gallery images above for more product views. 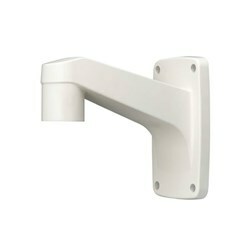 FactoryOutletStore stocks a full line of accessories like Wall Mount Bracket for the Samsung SCV-3081. The Samsung SCV-3081 is sold as a Brand New Unopened Item.